Combine the water, apple juice, sea salt, brown sugar, curing salt, and pickling spice in a large pot. Bring to a boil. Stir well to dissolve the salt and sugar. Remove from the heat and set aside to cool. Add the brisket to the brine. Place a weight like a ceramic bowl over the brisket to keep it submerged. Cover. Refrigerate. Cure for 6 to 7 days. Turn the brisket once a day, at the same time stir the brine to keep the salt well mixed. Drain and thoroughly rinse the brisket under cold water. Preheat the smoker to 250° F (120° C). Place the brisket fat side down on the grate. Smoke the brisket for 4 hours then wrap the brisket in aluminum foil and smoke for another 2 hours or until the internal temperature of the meat is 195 to 200° F (90 to 93° C). 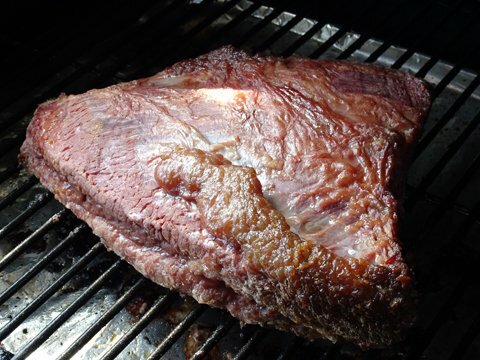 Place the brisket in foil on a cutting board to rest and cool, for 1 hour. Remove the foil and slice the corned beef, against the grain, into 1/4-inch thick slices.